Between digital overload, sleep deprivation, and the stress of modern life, most people's brains are constantly in flight-or-fight mode, with levels of cortisol and other hormones and neurotransmitters out of whack. Brain conditions ranging from childhood ADHD and adult depression to memory impairment are on the rise, and medications for brain conditions, if available, do only a mediocre job while generating a host of debilitating side effects. Fortunately, Rebecca Katz has harnessed the latest research on brain functioning to identify how the foods we consume can improve the brain's ability to control cognition, emotion, and physical function--all of which dictate memory, mood, and motion. These 120 recipes translate the very best of this science into the kitchen, incorporating nutrient-dense foods that best promote brain health and development from childhood through the golden years. Cookbooks...one of my few major weaknesses... This popped up on my screen and I couldn't hit yes fast enough. As someone who desperately needs to focus more on her health, not just body but also mind, I thought this was the perfect opportunity for me to pick up a tool that could help in that. Now, I have to say that nutrition science seems to be changing nearly every day, but the core of what's good and what isn't never changes. Plus, this book opens up with not one, but two chapters talking about the science behind everything. Then, there's a chapter devoted just to taste and flavor. That's right, there are three chapters packed full of information before you even get to the recipes. If I have one complaint, it's that not every recipe has a yummy photo to go with it. However, the photos that are there are stunning and made me want to run to the store more than once. Luckily for my gas tank, the reminder that the store was a good 15 miles away put a stop to me running around the countryside. 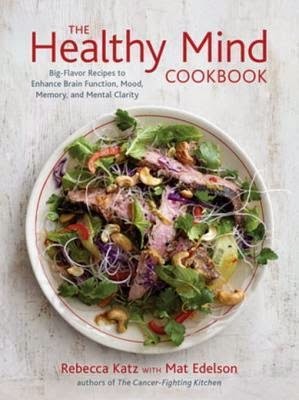 If you love a well put together cookbook that is full of recipes that may or may not be good for your brain, but will certainly be good for your body and your tummy, I recommend The Healthy Mind Cookbook.